The full potential for a true biomass program with short-rotation poplar was demonstrated by a recent harvest at GreenWood Resources’ Boardman tree farm. The five-year-old poplar trees (three-year-old coppice) were harvested for a second time with a New Holland forage harvester using a slightly modified header. This harvest is different from the initial harvest (January 2013) in that the trees have established a root system and have more above ground biomass. 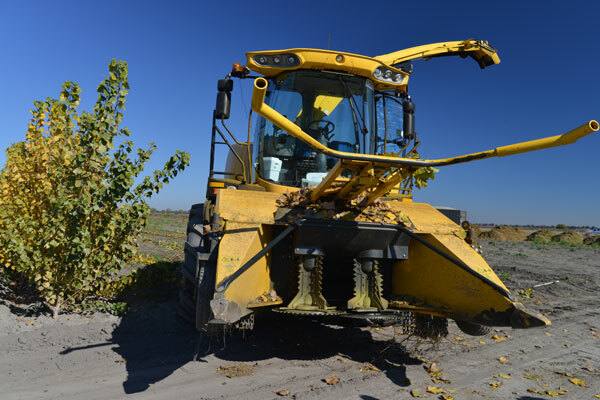 Short-rotation poplar trees were recently harvested in Boardman, OR using a modified Case New Holland forage harvester. The Boardman harvest represents potential biomass yields from a second coppice rotation. The trees at Boardman are irrigated and yields are as high as 22 bone dry tons per acre (BDT/ac). The first harvests at the four AHB demonstration sites and at Boardman had relatively low volumes, as expected, because the young trees were establishing their root systems. The prediction for the second harvest at the demonstration sites is to yield more biomass after three years of growth, with yields from 17 to 25 BDT/ac. This harvest was the first test of using the New Holland forage harvester on second rotation poplar trees. While the harvester worked well overall, GreenWood Resources (GWR) did find some challenges harvesting the larger biomass. Bruce Summers of GWR explained that they found the larger poplar stems (larger than 5”) to be problematic for the harvester’s header, which was designed for smaller willow stems. Summers worked with New Holland’s Industrial Innovation group to implement a few modifications to the header to deal with the larger poplar biomass. They resolved some issues with different saw blades that are more robust and specifically for poplar. “We are pushing the limits of the equipment,” said Summers. He also explained a second challenge, which is the power limit for chipping the size and number of stems harvested. In harvesting the first rotation at the AHB demonstration sites, the harvester had to go slow enough to allow adequate time to cut through the stem with the saw, otherwise the tree stumps were pulled out of the ground. In harvesting the second rotation at Boardman, the limiting factor was not speed but harvester horsepower. The multiple stems in each “tree stump” were over four inches in diameter. Subsequently, the harvester travel speed was much slower to allow the chopper to chip the stems, resulting in less-than-optimal harvest rates. A harvester with more horsepower could potentially solve this problem. More will be learned when the second rotation is harvested at the four AHB demonstration sites in 2016 and 2017. Data will be obtained on the best poplar clones for bioenergy and potential yields from large-scale bioenergy farms. These sites were planted specifically to develop and optimize the logistics of growing and harvesting short-rotation poplar.